Located on 20 private acres with amazing views and wildlife, this is the perfect spot for single, multiple families or groups to vacation together while still providing privacy. Originally built as a family retreat and operating as a Bed & Breakfast for 10 years, the Pleasant Pheasant is now available for rent. Wonderful for children, sportsmen or those simply wanting to enjoy the great outdoors. 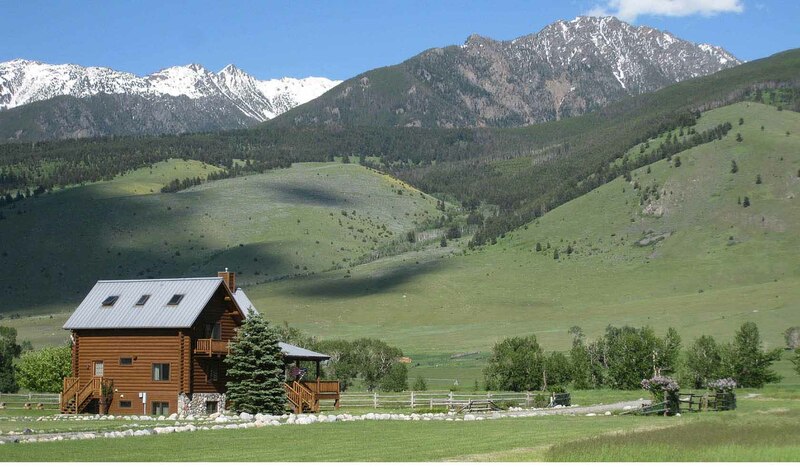 In the heart of scenic Paradise Valley, we are 17 miles south of Livingston and 30 minutes north of Yellowstone National Park. Chico Hot Springs is 10 minutes away. Nearby activities include river rafting on the Yellowstone, hiking, horseback riding, clay shooting, and mountain bike riding. A fly fisherman's paradise, the Valley also boasts three of the world's top spring creeks, all within a ten minute drive. Property includes a log home with cathedral ceiling, a large outdoor deck, and screened-in porch. Three bedrooms, two full baths, kitchen, living, and dining room are upstairs. Downstairs is a 2 bedroom, 1 full bath suite, complete with another full kitchen, living and dining area. Additional living areas (sleeping up to 10 more people) include a detached 3 bedroom, 1 bath bunk house and a 1 bedroom, 1 bath cabin. All kitchens are fully stocked with everything you need and more!